New Holland Agriculture is the only agricultural machinery brand to participate to Expo Milano 2015 with its own pavilion. A presence made ​​possible by the global partnership of FCA and CNH Industrial. The Sustainable Farm Pavilion is rapidly taking shape and will be completed by the end of December. The imposing structure will host the best of New Holland in terms of technology applied to agricultural mechanization and sustainability, aimed to meet the growing needs to feed the planet. "We believe that the use of sustainable and efficient agricultural practices is the future of agriculture, by which farmers around the world can produce high quality food along with efficient and clean energy for the needs of their farms and local communities ", said Carlo Lambro, Brand President of New Holland Agriculture. "Our Sustainable Farm Pavilion will bring the Expo Milano 2015 visitors closer to farming and take them on an interactive journey through the evolution of agriculture. There we want to plant the seed for a better future of food safety and respect for the environment”, he concluded. The importance of agricultural mechanization in the food supply chain. Climate changes, the growth of the population and the need to reduce agriculture’s carbon footprint have led to an increase in consumption and demand for natural resources in the world. This global push for a more efficient agriculture combined with a concern for a sustainable and equitable future is fully consistent with New Holland’s most important values, which underpin the Clean Energy Leader® strategy. It is rooted in the belief that farmers can use technology to help them improve the production of quality food and clean energy and at the same time reduce pollution, waste and human fatigue. Expo is a unique opportunity for New Holland to show the general public the role of agricultural mechanization in the food supply chain while preserving the natural resources and reducing the environmental impact. The realization of the pavilion was entrusted to the general contractor Tecnoappalti, following a competitive tender. It is built on an area of ​​over 1,600 square meters where visitors from all over the world will be able to see the key of agricultural innovation according to New Holland. The criteria for sustainability and energy saving are also reflected in the design and implementation of the architecture itself. The most advanced construction technologies, including dry construction, are used to build the impressive structure. They provide a significant reduction of the time needed for building up and dismantling work. The pavilion is built in the total absence of cements and any other binder material that determines, by the end of the exhibition, demolition work, with the recovery of all the individual components. The main scaffolding of the entire structure, including the foundations, are made ​​of steel with the obvious advantage of having a cleaner and better organized construction yard, as the work site processes shall be limited to assembly of the building components. 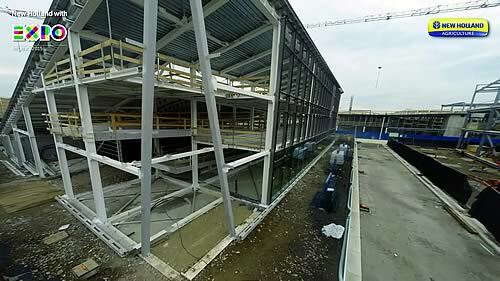 Part of the energy needed for the operations in the pavilion will be produced by the photovoltaic cells integrated in the large windows of the South facade. At the end of the exhibition, the pavilion will be disassembled, reassembled and used for different purposes.